Big brakes aren't just about looks. They also provide engineered performance improvements to your stopping power. Our kit uses premium quality components to provide you with excellent braking performance. 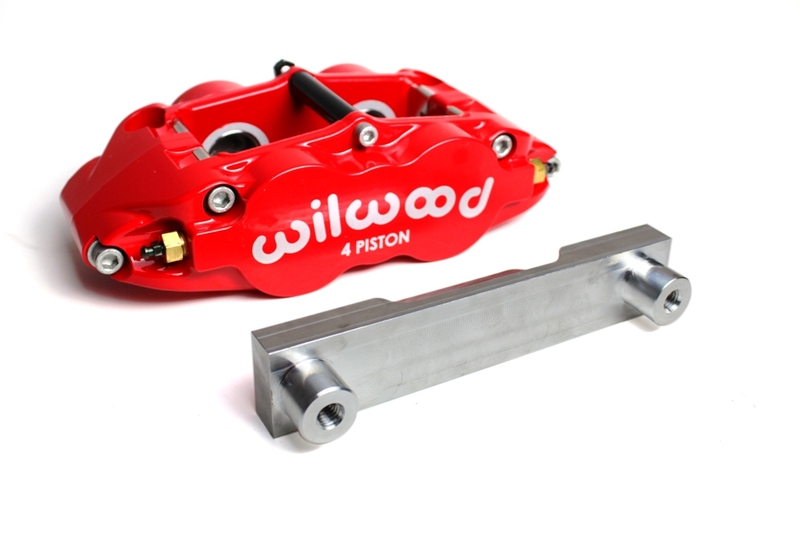 The Wilwood Forged Narrow Superlite 4 calipers offer superior performance through the extremely durable and efficient body design. Starting at 4.9 pounds the most noteworthy feature of this caliper design is the forging. Each body is stress-flow forged from premium grade aluminum alloy billets. Stress-flow forging re-aligns the metal's internal grain structure to flow within the contour of the caliper body. This process eliminates the stresses and interruptions to the internal grain structure that occur when machining a straight block billet. Simply stated, there is no better way to build a stronger aluminum caliper body. The Brake discs chosen for our e34 rear big brake kit are made by Zimmermann, a trusted name in brake components. The Zimmermann Coat-Z brake disc provides a protective coating that prevents rust and corrosion, extended rotor life and improved visual appearance. To improve the rust protection during storage and usage, Zimmermann implements a new Coat-Z technology step by step in its production range. Beside the still optimum function of the brake disc, this coating ensures a consistent attractive appearance. The best part about designing our big brake kit with these rotors in mind is the very much affordable replacement cost. Unlike 2 piece rotors which can be expensive or limited in available locations for sale, these rotors are replaceable with a stock BMW part number. This makes them readily available at almost any auto parts store. Copyright © 2019 Miller Performance - Home of the WAR Chip. All Rights Reserved.